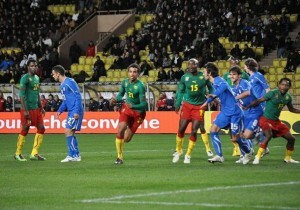 The Indomitable Lions of Cameroon put up a brilliant performance against the reigning world champions Italy in Monaco, France.They thrived in holding the 4th ranked team in the world to a zero all tie.The head coach Paul Le Guen was able to inject a new breed of skillful and youthful defenders like Nkoulou,Bassong,Assou Ekotto,Mbia,Nonkeu and the new comer Abouna Ndzana of Astre de Douala. The attack was unable to bring forth a goal despite enormous efforts by Jorge Kouemaha and Samuel Eto’o.We are yet to see fluidity in the attack line. Also visible,was the naive but skillful performance from Joel Matip who was making his first entry in Cameroonian colours. Italy coach Marcello Lippi’s experimental line-up failed to deliver as the Azzurri were held to a goalless draw by Cameroon. Lippi used the friendly in Monte Carlo to try out some of his fringe players and despite his team dominating the encounter, they were unable to find the finishing touch.Both sides will went into the match on the back of first-place finishes in their World Cup qualifying groups. Azzurri tactician Lippi, who led Italy to victory in the 2006 World Cup, tested a 3-4-3 formation with AC Milan striker Marco Borriello returning to the squad for the first time in almost two years. Borriello formed the Azzurri’s attacking line alongside debutant Andrea Cossu and Antonio Di Natale as Lippi used the game to evaluate several candidates to complete his World Cup squad. Cagliari goalkeeper Federico Marchetti replaced injured Gianluigi Buffon in goal and was never tested by Paul Le Guen’s side. The Italians had the first scoring opportunity early on when Di Natale latched onto Andrea Pirlo’s free-kick and his header went over the bar. Italy thought they had taken the lead when Giorgio Chiellini fired past Cameroon goalkeeper Hamidou Souleymanou but the goal was ruled out for offside. Cameroon had their first chance midway through the first half but Georges Mandjeck struck the ball poorly from a good position. At the other end, debutant Cossu fed Di Natale and his left-footed diagonal strike went wide. The Azzurri continued to press forward and their efforts were almost rewarded shortly after the half-hour mark. Cossu served Di Natale and the Serie A top scorer’s strike from the edge of the area was met by a fine clearance from Hamidou. Lippi made three substitutions after the restart, including Giampaolo Pazzini replacing Borriello. Pazzini got to work immediately and passed to Di Natale inside the area. His powerful strike was cleared by Hamidou. Shortly before the hour mark, Di Natale wasted a good chance with his effort from substitute Claudio Marchisio’s assist going way off target. At the other end, Mandjeck’s dangerous cross proved an easy catch for Marchetti. In the 70th minute, debutant Leonardo Bonucci should have broken the deadlock. Cameroon’s defence failed to clear a corner but Bonucci could not tap the ball in. With 10 minutes remaining, Marchetti came off his line to anticipate Achille Webo as he was ready to score from a fast counter-attack. With seconds remaining, substitute Gennaro Gattuso made a crucial tackle on Samuel Eto’o, with the Inter Milan forward ready to knock in the winner. Italy did not win, but Lippi was not downhearted following his interview with ESPN.